Sewing Circle: What is a lining? This time we're talking about linings. Very important, a little confusing. I've actually received two questions recently, regarding linings. 1) What are they, and 2) What fabrics are best for them? Q: I am very new to making clothes, and I guess I just don't really understand how to make a lining for a dress. I know what fabric to choose, but how is the lining constructed, and how do you invisibly sew it in? a pattern I recently followed offered no guidance for this. I have lots of reading and learning to do, so maybe this is the dumbest question ever, but maybe you can take some the mystery out of it for me. A: Not a dumb question at all, Rachel! There's a lot going on in it, though; there are a lot of different kinds of linings and options. I'll talk about the most basic, the kind that I use in dressmaking. Let's say I'm going to make a dress out of this pattern. Let's say I'll be using an opaque fabric that stands up on its own, like a colored cotton twill or crisp dupioni silk. Look at the green dress in the photo on the pattern... it probably has a typical lining. Let's just talk about the bodice, because the skirt probably won't need a lining. A slim, fitted skirt would, but a gathered or pleated skirt like those above won't if it's substantial enough. For that dress, I would cut out the dress of the green and cut every piece exactly the same out of a lining fabric, preferably something either a similar color or a close-to-skin color lining, just in case it ever shows a little. Great. Now, you'll assemble the bodice--do the darts, do the side seams, and shoulder seam. Don't sew in the sleeves. Do all the same seams on the lining, making the darts face the inside of the dress--make everything as if the lining were going to be the outside fabric. (Before you put in the lining, try the bodice on to make sure it fits! Any changes you make to the outside fabric you also have to make to the lining). Now, sew right sides together the bottom edge of the sleeve, then press and turn with a tiny 1/8" extra roll-under of the outside fabric at the bottom edge so the lining doesn't show or peek out. You can understitch, also. Press and pin the sleeve so the lining is folded back up against the outside fabric (it may not line up perfectly at the top because of the slight 1/8" offset, but ignore the extra lining or trim it off). 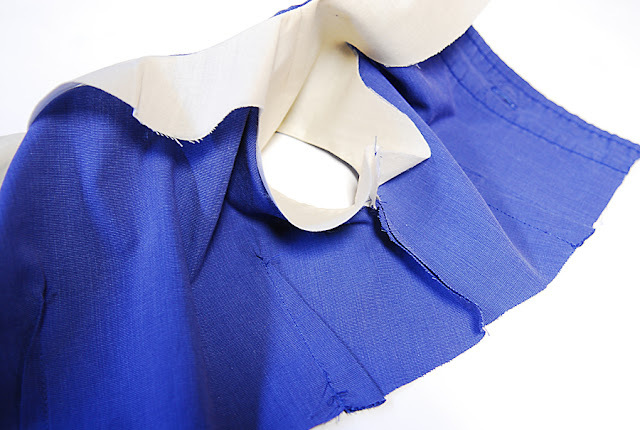 Do the same thing to sew the lining to the inside of the dress on the neck edge. (Wish I had pictures... there really should be instructions in the pattern for this! Eek!). Sew the neck edges together right sides together, then turn and press. Do understitch to keep the lining in place--a row of stitches on the lining side less than 1/4" from the fashion fabric. Now, fold the lining inside the dress they way it will be when you're wearing it. I use pins to anchor the side seams and shoulder seams in place, at the armholes and at the waist. 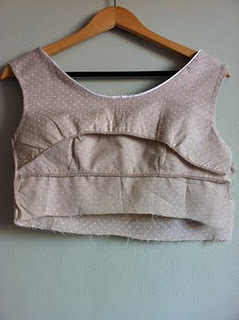 Keep everything together, and insert the sleeve into the armhole right sides together, and sew it in. Try it on again, and if everything fits, serge or zigzag the raw edge inside. Now you have a fully lined bodice. Keeping pins in place on the waistline edge, you can attach this whole thing as one to your skirt. Again, I wish I had pics, but I don't have any dresses planned right now! I do recommend looking at any storebought dresses you have. You'll see the darts are hidden between the lining and the outer fabric, and there is probably understitching to keep the lining or facing in place. Oh, facings, that's another ballgame... more on them later! Bodice and lining, not assembled, at Second Bedroom. 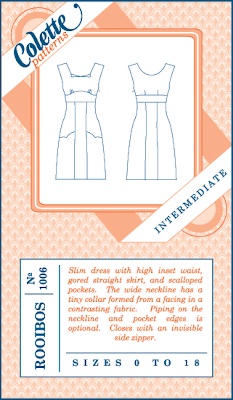 Note the steps are a little different for a sleeveless dress. Q: I was wondering if you would do a post about linings and interlinings. What lining fabrics should you use? Do you have any tips and tricks for construction when a pattern doesn't call for a lining? In particular, there are a lot of beautiful lightweight cotton voiles and lawns out there right now but they definitely need to be lined with something - what would you suggest? And any ideas you have about where to purchase lining fabrics (for instance, I haven't found any cotton batiste at Hancock Fabrics or Joann's, but it's definitely possible that I'm not looking in the right spot!)? Great questions! 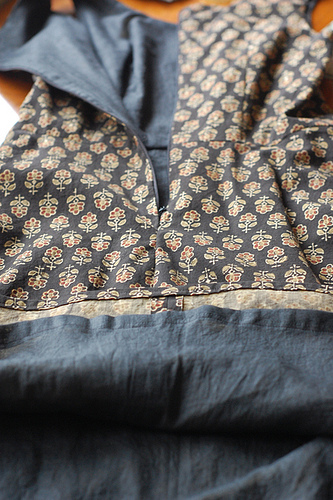 For dresses, I often use whatever lining pieces I have lying around, although ligthweight cottons are nicest. The lining fabrics sold at JoAnn or most fabric stores in the linings section can be icky, it's true--the nicest ones are rayon, but the poly ones are cheaper and available in more colors, although they collect sweat and aren't as nice to wear. 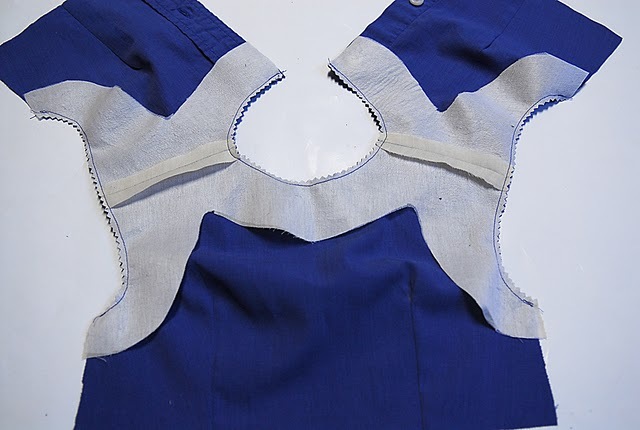 However all of these are better for wool dresses or skirts and jackets, and for a cotton dress bodice, a really nice lining is a fine, lightweight cotton. 100% cotton batiste would be best, but you can't buy that at most fabric stores--try ordering online--one option is the lovely 100% white cotton lawn, even more lightweight, from Home-Sew. Fashion Fabrics Club has some nice cotton batistes, too, and they come in a few colors. I've never made a lined blouse or top, because that sounds sort of weird (although I do have some storebought cotton tops that have a detatched lining of a lighteweight cotton of the same color). So for those lovely lightweight shirtings... one option for is to make them completely unlined, with beautiful seam finishes: French seams, felled seams, pinked raw edges, etc. Then, like they did in the 1920s and 1930s, wear it over a coordinated slip. The slip can be peach, beige, or a color that picks up something in the fashion fabric. Just always wear the sheer as a layer. As I said I'll talk about facings later--on dresses and such, when they call for a facing, if possible I usually just give it a full or partial lining because it's easier and then I don't have to use iron-on interfacing. Phew, that's a lot about linings! Readers, please chime in your tips and ideas! Thanks, all, for reading Sewing Circle! P.S. Here's some pics of facings. Thank you so much for this post. A lot of really helpful information. I really appreciate the time and energy!! Thank you for this! 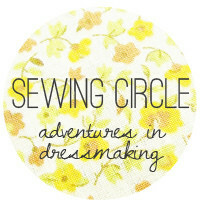 I'm learning to sew and it was really helpful :) I really love your blog, by the way! Really helpful, thanks! Quick question, what would you do if you need to make alterations once the lining is sewn in, eeek?! @Thejoya, once the lining is sewn in it will be a lot more complicated to make alterations, which is why you need to be sure of the size before you put the two together and attach to the skirt. You'll have to unpick the seam connecting the bodice to the skirt, and change the darts or side seams or whatever from the inside--for both the lining and the fashion fabric.